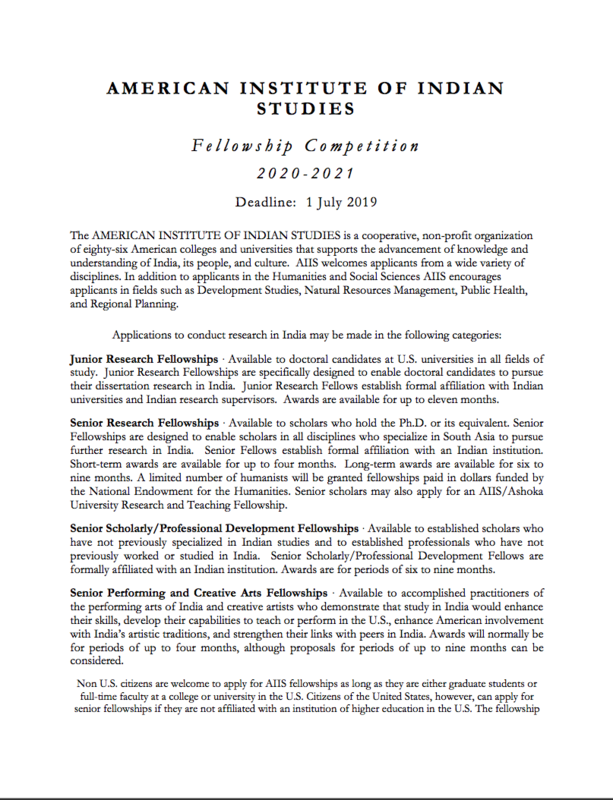 The American Institute of Indian Studies (AIIS) invites applications from scholars from all disciplines who wish to conduct their research in India. Junior fellowships are given to doctoral candidates at universities in the U.S. to conduct research for their dissertations in India for up to eleven months. Senior long-term (six to nine months) and short-term (four months or less) fellowships are available for scholars who hold the Ph.D. degree. Scholarly/Professional development fellowships are available to scholars and professionals who have not previously worked in India. Creative and Performing Arts fellowships are available to practitioners of the arts of India. Eligible applicants include 1) U.S. citizens; and 2) citizens of other countries who are students or faculty members at U.S. colleges and universities (this rule does not apply to U.S. citizens). Applications can be downloaded from the web site www.indiastudies.org. For more information please contact the American Institute of Indian Studies (773) 702-8638. Email: aiis@uchicago.edu. Web site: www.indiastudies.org. Application deadline is July 1, 2019.